Of all the places President Obama might give a speech on job creation, an Amazon warehouse is a particularly perplexing choice. Here are five ways Amazon is costing our economy and undermining real job growth. 1. Amazon destroys more jobs than it creates. Brick-and-mortar retailers employ 47 people for every $10 million in sales, according to an analysis by ILSR of US Census data. (If you exclude chains and look just at independent retailers, the figure is even higher — 52 57 jobs.) But Amazon employs only 14 people per $10 million in revenue. As Amazon grows and takes market share from other retailers, the result is a decline in jobs, not a gain. In 2012, Amazon expanded its share of retail spending in North America by $8 billion, which works out to a net loss of about 27,000 jobs. 2. Most Amazon jobs are awful. How does Amazon manage to sell so much stuff with so few workers? The online giant is technologically efficient, yes, but it also excels at squeezing a back-breaking amount of labor out of its employees. 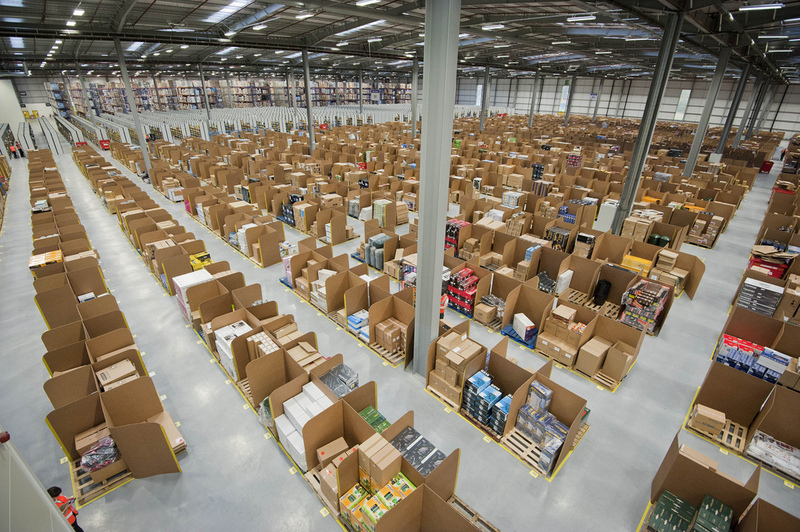 Amazon’s workplace abuses, including life-threatening temperatures inside its warehouses, injury-inducing workloads, and neo-Nazi guards, have been well-documented by investigative journalists. At the Amazon warehouse Obama is visiting in Chattanooga, workers are paid about $11.20 an hour, according to Glassdoor.com. That’s 17 percent less than the average wage for U.S. warehouse workers reported by the U.S. Labor Department. 3. Amazon pilfers value created elsewhere in the economy. Another way Amazon gets by with such a small workforce is by leaning on the services provided by brick-and-mortar stores. Through its mobile app, Amazon actively encourages consumers to try-out merchandise in stores and then buy online. This allows Amazon to free-ride on the value created by other businesses. Take books, for example. Amazon now accounts for about one-third of book sales. But, if you ask Amazon book shoppers where they learned about a book, only rarely is the answer Amazon. Far more often, according to research by Codex Group, they discovered the book while browsing in an actual bookstore. A similar dynamic is at play across a wide variety of products, from toys to cameras. The threat Amazon’s free-riding poses to the U.S. economy is that, over time, brick-and-mortar stores will no longer be around to showcase new products, depriving both consumers and manufacturers of a valuable service that stimulates demand and innovation. 4. Amazon drains dollars from local economies. While the figure for national chain stores is considerably smaller, it’s almost zero for Amazon. In most cities and towns, save for a small amount paid to delivery drivers and perhaps a few third-party sellers using Amazon’s platform, all of the money residents spend at Amazon leaves their local economy, never to return. Amazon’s growth has come at a significant cost to taxpayers. The company has been demanding special tax rebates and subsidies as it expands. It recently received an $8.5 million subsidy to build a warehouse in Delaware, a $2 million grant to expand in Indiana, and more than $10 million worth of tax incentives to open the Chattanooga facilities President Obama is visiting this week. These deals are on top of the enormous financial advantage Amazon has enjoyed by virtue of not having to collect sales taxes in most of the country for the better part of two decades. That advantage is slowly coming to an end, but, over the years, it cost states and cities billions of dollars in lost revenue, while forcing local retailers to compete with one hand tied behind their backs. The future Amazon has in mind for our country is a far cry from the middle class prosperity President Obama has been seeking. A better place to look would be along Main Street, among the new generation of independent businesses, small-scale manufacturers, local food producers, and others that are beginning to chart a much more viable path from here to there.